My friend Eric, along with two of his friends Pascale and Mary Lou went to see Kathy Griffin perform at DAR Constitution Hall in Washington, D.C. We had great seats smack in the center. 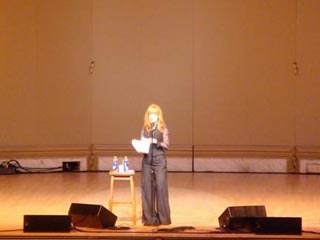 It was Kathy’s first performance since she won her Emmy for Outstanding Reality Program for her work on ‘My Life on the D-List’. Her material focused on a lot of behind-the-scenes dirt from the Emmys and politics — not surprising considering the location and it being an election year. Her show lasted about an 1 hour and 45 minutes and was solid entertainment. A nice and well-needed laugh break from the stress of everything in the news.